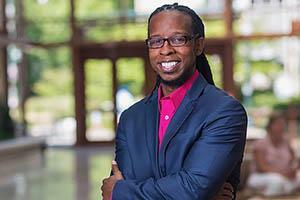 Ibram X. Kendi, Professor of History and International Relations and Founding Director of the Antiracist Research and Policy Center at American University, has been awarded a prestigious 2019 Guggenheim Fellowship from the John Simon Guggenheim Memorial Foundation. Kendi, an award-winning author and historian on issues of racism, has a joint appointment with AU’s College of Arts and Sciences and School of International Service. As a Fellow, Kendi joins a distinguished group that has included scores of Nobel laureates, Fields Medalists, poets laureate, members of the various national academies, and winners of the Pulitzer Prize, National Book Award, and other internationally recognized honors. During his Fellowship, Kendi will be working on his next book, tentatively titled, Bones of Inequity: A Narrative History of Racist Policies in America. The book is under contract with One World, an Imprint of Random House. Kendi describes Bones of Inequity as a prodigiously researched sweeping narrative of anti-Black racist policies from their origins in colonial America to the present. Kendi is one of the nation’s leading scholars on racism. He is also an award-winning historian, a New York Times bestselling author, and an Ideas Columnist at The Atlantic. At 34, he won the 2016 National Book Award for Nonfiction for his book Stamped from the Beginning: The Definitive History of Racist Ideas in America, making him the youngest-ever winner of the NBA for Nonfiction. His third book, How to Be an Antiracist, will be published this August. Kendi says that Bones of Inequity will redefine and broaden our conception of racist policies, thus opening the door of history to unknown and unacknowledged policies that have formed racial inequities. As the founding director of American University’s Antiracist Research and Policy Center, Kendi is fulfilling his vision of producing research that can support the enactment of antiracist public policies at the local, state, and national level. The Center was established in 2017, and it has already accomplished multiple high-profile initiatives. In December 2018, the Center launched The Guardian's Antiracism and America project, a weekly web series that examines the policies and ideas that sustain a racist society and how we dismantle them. Contributors have included Eve Ewing, Robin DiAngelo, Anand Giridharadas, Imani Perry, and more. The Center also partnered with the Frederick Douglass Family Initiatives and The Guardian to honor the life and legacy of 200 living individuals who embody the work and spirit of Frederick Douglass. The initiative culminated in February with a black-tie awards gala at the Library of Congress. Attendees included Alicia Garza, Amy Goodman, Naomi Klein, Mayor Chokwe Lumumba, Sandra Cisneros, Min Jin Lee, Carmen Perez, Wesley Lowery, Helen Zia, and many more. The Center’s next event, on April 27, 2019, is the 1st Annual National Antiracist Book Festival at American University’s Washington College of Law. In partnership with First Book, the #AntiracistBookfest is the first and only book festival that brings together, showcases, and celebrates the nation’s leading antiracist writers and helps to prepare the writers of tomorrow. Limited tickets are still available.